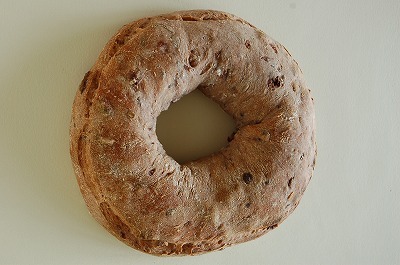 This loaf is ideal for home parties. 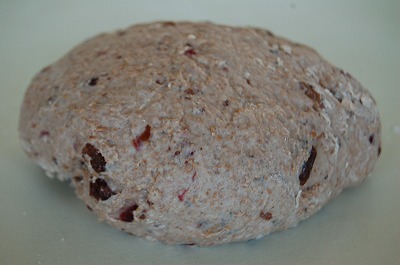 I used raisin and currant, cranberry for this loaf. I soak them with red wine. After soaking, red wine turn into sweet, contain dried fruits flavor. I didnt use kneading machine, because I didnt want to crash reserved fruits with the kneading machine. I kneaded the dough by my hands gently. 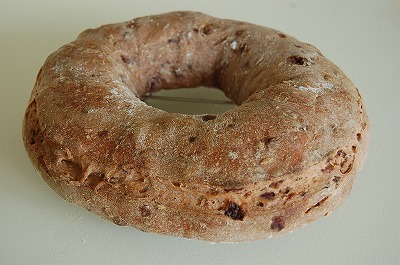 The crust looks brown but the crum (dough) becomes light red color. It taste sweet and fruity. I like it to taost lightly and have it with butter. 1. 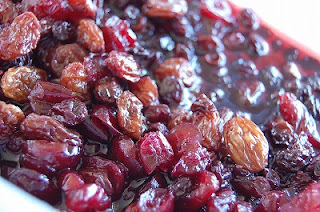 The day before, soak dried fruits with red wine. Set it over night. Drain the dried fruits. Combine the wine with water to make 225cc. 2. In a large bowl, combine the flours, salt. 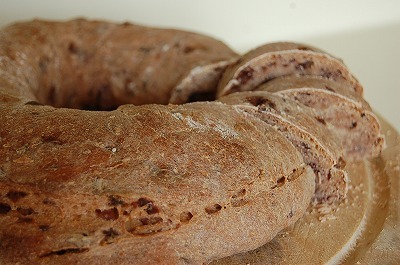 In another bowl, combine sourdough, yeast, water and red wine. 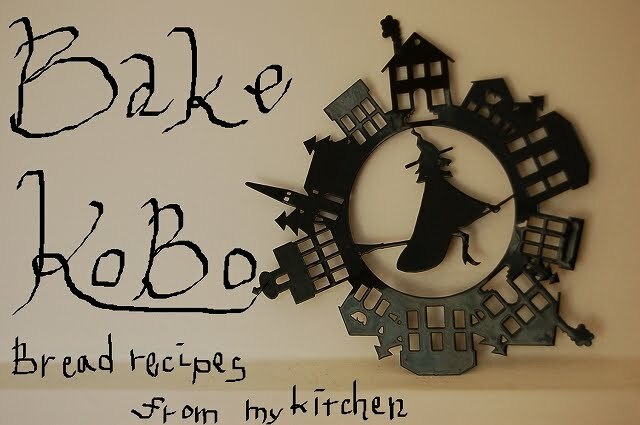 Add liquid into flour's bowl. Mix it with your hands until the ingredients are just combined. Cover and set rest for 10minutes. 3. Turn the dough onto the floured counter, and knead 5minutes. Return the dough to the bowl, cover, and let rest for 30 minutes.Knead the dough for another 5minutes. 4. 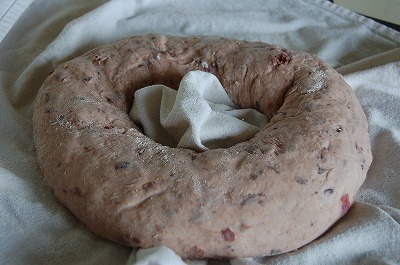 Return the dough to the bowl, and let it ferment, covered, for one hour, with a fold 1hour. Proof it 6 - 8hours. 5. Pour the dough onto floured counter, then deflate it, knead briefly. Make a ball raughly and let rest, covered, for 15 minutes. 6. Shape into final loaf. Pat the dough into a flat rectaangle with your palm. Roll it up and make it a sylinder. 8. 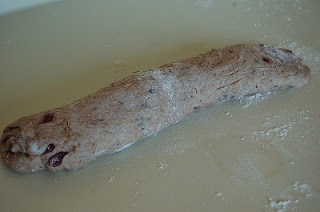 Place it into warm place with cover, rise it for 1.5- 2 hours till it becomes double size. Preheat the oven and the baking tray at 230℃. 9. Remove the baking tray from oven, and place the dough onto the baking tray. 10. Bake it 220℃ with steam for 10minutes, then turn down 200℃ for 25 - 30 minutes until it become golden and brown. 11. Cool it down on a wire rack.